What is a street child? 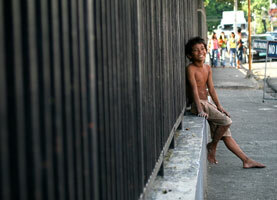 Street children are minors who live and survive on the streets. They often grow up in public landfills, train stations, our under the bridges of the world’s major cities. Because of conflicts with their family, these children don’t want to or can’t return home. Why does a child live on the streets? The phenomenon of street children is multifaceted. The combination of familial, economic, social, and political factors play an important role in their situation. It is therefore very difficult to single out one or more causes. However, children who have been questioned say that family, poverty, abuse, war, etc. are often why they left for the streets. What are the problems encountered by street children? Street children are confronted by a large number of problems. In fact, growing up in an environment generally regarded as dangerous, they incur considerable risks. As a consequence, some of their rights are very often compromised. 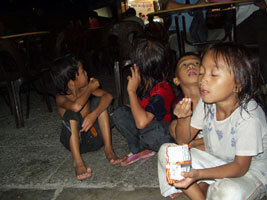 Street children often don’t have access to a healthy and sufficient diet. Sometimes they don’t even have food, because living on the streets, they don’t produce any and don’t have money to buy. Also, these children don’t benefit from a balanced diet: they eat what they can find. Sometimes, when they have the choice, they even favour unhealthy foods such as ice cream, cakes, etc. and so run the risk of malnutrition. Growth problems are also common with these children. The health of children growing up on the streets is strongly compromised. In fact, they don’t have access to sanitary facilities: they are often dirty and infested with fleas. Also, because of their lack of hygiene, street children are exposed to different diseases. Their health is often troubling. Without a family to take care of them, these youth must take care of themselves. Additionally, street children, to escape their reality, often use cannabis, alcohol, or inhale natural gas. Unfortunately, these very hard living conditions, have a negative impact not only on their physical and psychosocial development, but also on their cultural and economic development. Street Children are obviously not educated. Because of this, they don’t have the same opportunities as other children. In fact, because they don’t see a future for themselves, and because they have no professional training, they are hindered from finding a job and from finally leaving the streets. Seen as marginals, street youth are often victims of discrimination. Generally, adults have prejudices that stigmatise them as “street children”. Consequently, they are often associated with the dangers of the streets. It is often difficult for these children to reintegrate into society. What can be done to help street children? The problem of street children is dependant on their situation and not on their status. In fact, each child has a personal history with the street that cannot be generalised. Because of this, the care of street children must, to be effective, hinge on the different situations on the streets, in other words, on the many “child profiles”. It is important to analyse the relationship a child has with the street. In order to better understand children living and growing up on the streets, it is essential both to make them participate, and to put them in contact with key institutions or individuals looking to understand the structural causes of their situation. Riccardo Lucchini. Comparative study of the child in a street situation in Latin America: drug, family, identity. Riccardo Lucchini. (1996). Enfants de la rue : identité, sociabilité, drogue. Éditions Droz, Genève, Paris. Daniel Stoecklin. (2008). Enfants en situations de rue. Prévention, intervention, respect des droits. IUKB / IDE, pp. 53-65. D. Stoecklin, I. Rizzini & U. Mande Butler (Eds.) : « Life on the Streets. 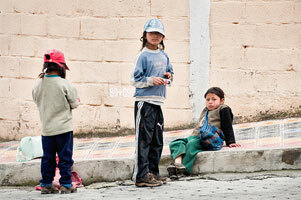 Children and Adolescents on the Streets : Inevitable Trajectories? », Sion : Institut International des Droits de l’enfant, 2007, 206 pages. D. Stoecklin, « Enfants des rues en Chine. Une exploration sociologique », Paris, Karthala, 2000, 367 pages. Ch. Wiliams, « Who are Street Children ? A Hierarchy of Street Use and Appropriate Responses », dans : Child Abuse, vol. 17, 1993, pp. 831-841. W. Myers, « Les enfants des rues : comparaison entre quatre études menées en Amérique du Sud », dans : Revue Internationale du Travail, Vol. 128, No. 3, 1990, pp. 357-372. Enfants en situations de rue. Prévention, intervention, respect des droits. World Vision, enfants des rues. L’Unicef se mobilise en faveur des enfants des rues des villes africaines. Sauver les enfants des rues, c’est possible. Tdh, enfants en situation de rue.